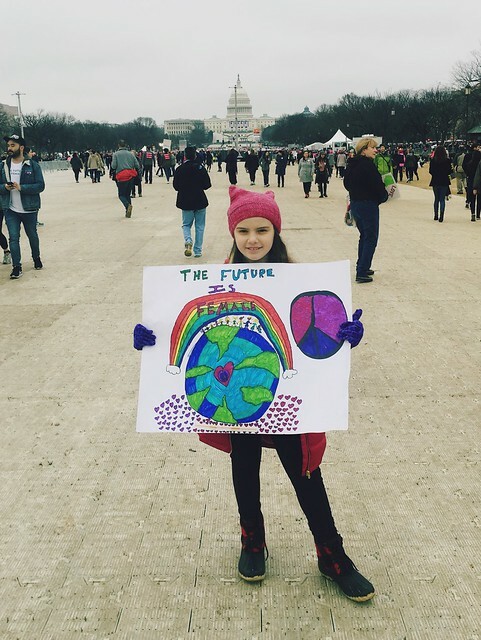 The following post was written by my daughter, Fable, age 8. 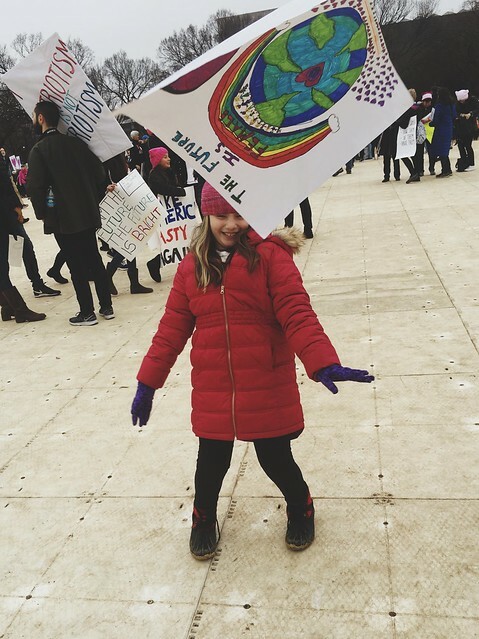 I thought it would be interesting to post three perspectives as grandmother, mother and child participating in the largest inaugural protest in history, and am so grateful for Fable for sharing her (unedited!) story today on GGC. Thank you, Fable. 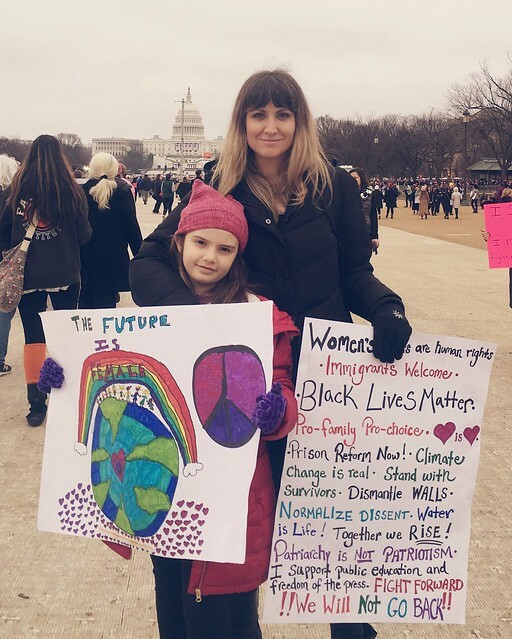 On January 21st I went to the Women's March in Washington D.C. When the day arrived I was just amazed! How did this day come so quickly? Why am I here? I paused when I woke up. I really asked myself again. Why was I here? I sat there frozen like a statue. Every time I thought about it I got deeper and deeper in my mind. A few minutes later, as I got deeper into my thoughts I finally knew what it was. Before I tell you let me tell you how I got it. In my second grade class we were learning about Martin Luther King Jr. My teacher passed out papers. They said: what is your dream? I'm like this is an easy one. What I basically said is: I dream that women can still be heroes and treated the same as men do. Our sad tragedy with our so-called "president" is that he won even though he said terrible things about people, including girls. He made me angry and sad and my mom was also angry and sad and pretty much everyone else. So that was my flashback. I was like, oh yeah! I'm here for the right of equality for ALL. So after that, my mom woke me up. "Hi, Fable," said my mom. After that I read her mind and got dressed. "How did you know that?" asked my mom. "Some things people just know," I replied. After that I went downstairs with my mom. I saw my aunt and grandma were there and cousin Marilyn. I asked Marilyn, "Can I have a yogurt?" "Sure," she said, "now what kind would you like?" Once everyone was done with breakfast we got our coats on. "Bye," we said to Marilyn and Mike. (Mike is Marilyn's husband.) We walked a few blocks to go to the Metro. When we got on the escalator, I was terrified. It was like 20 feet long. It also went straight down like a rollercoaster. The worst part is that it went as slow as a snail. After we got off, I was relieved. 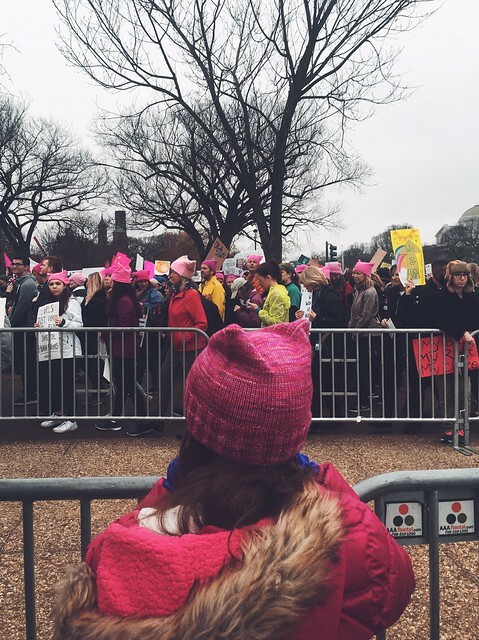 When we finally got on the subway we saw many, many people with pink hats. I was like WOW. Once we got off the metro there was a sea full of people. "Wow!" I said, "Can I have your phone, Mom?" I took her phone and put it on video. I started a video. 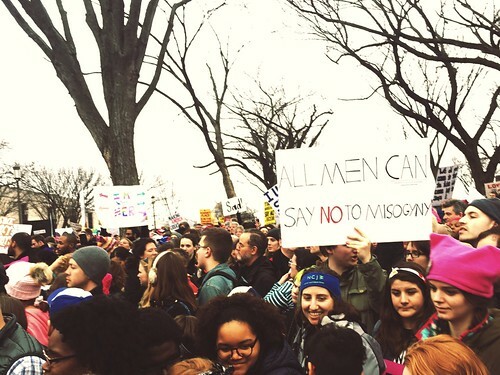 "As you can see there are tons and tons of people at this march," I said. Here's what happened when the march started: Everybody started chanting,"Say it loud, say it clear, Immigrants are welcome here!" Also "We are women, don't mess with us. We can hear, loud and clear!" Also, "show me what America looks like, this is what America looks like!" And, "what do we want? Equal rights. When do we want it? Now!" There were many more chants. It was hard to believe I was actually there. It felt weird and cool at the same time. It felt great like okay this is a girl party. Boys were there too though. Boys also disagree with what's happening which I'm really happy about. 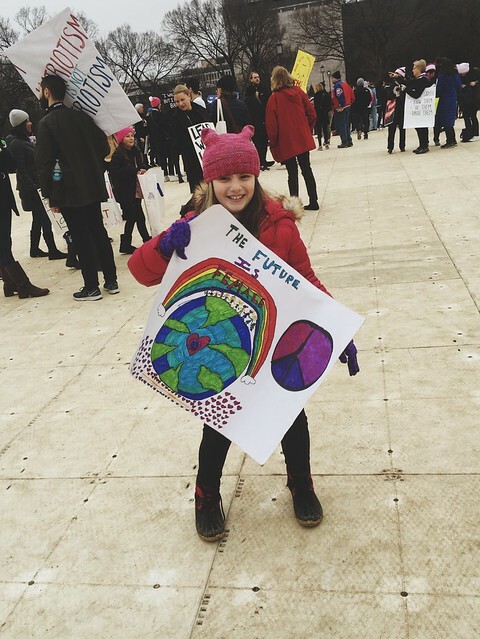 I think it's important to march for my rights so that I can do what I want to do and be what I want to be when I grow up which is President. 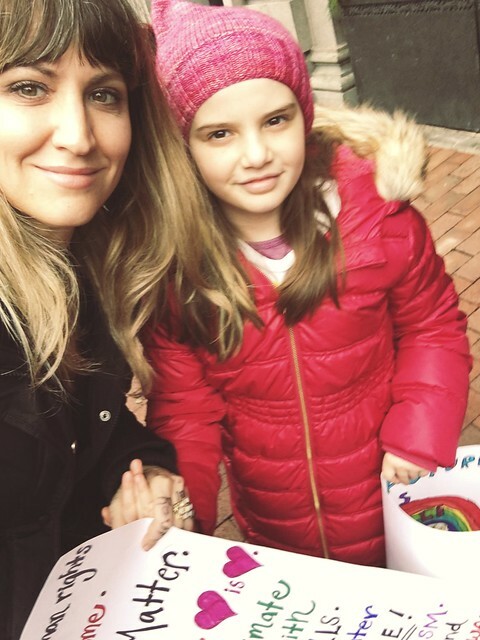 It was important for us to march because it matters to be involved. America chose someone who isn't the best guy so we need to be involved because who knows what will happen if we don't speak our minds and do something. It could be crazy. I will always remember the women who were chanting and holding hands. 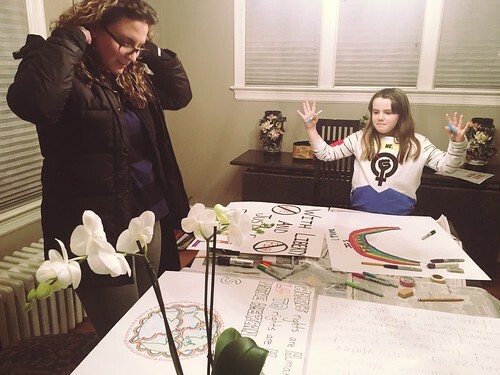 They had signs said that women are sacred. I will never forget the feeling I had when I was watching them. I couldn't believe my eyes. They were singing in their language and it was like wow. 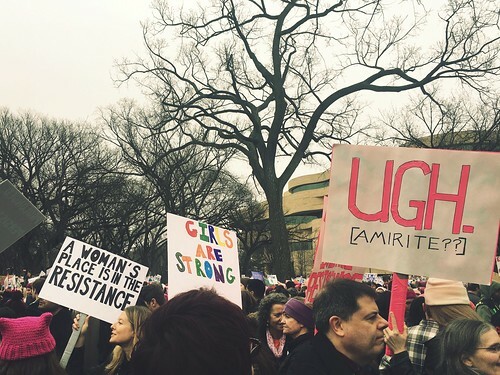 By the way, if you have never been to a march, I think you might want to try it. It's a really good feeling when you're surrounded by people who are cheering. You will definitely smile. It feels really good. 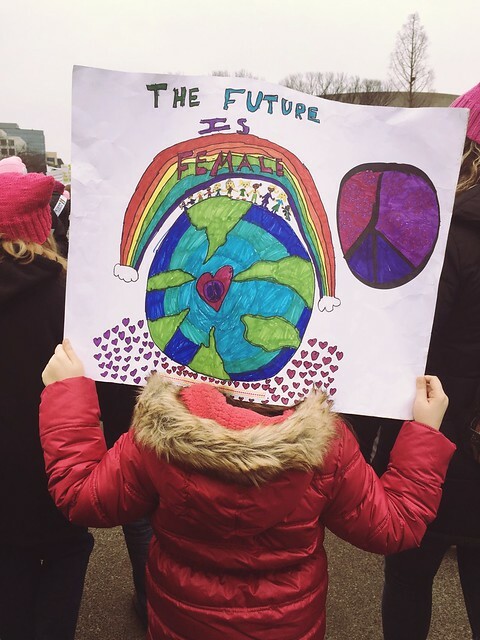 Oh and one more thing: The Future is Female.